Get ready, Weekend Warriors. There are so many things to do in Arlington this Labor Day weekend, you’re going to want to call in sick on Tuesday so that you can recover from all of your big fun. (We’re not saying you should do that. We’re just saying you’ll want to.) Off we go! Two of college football’s most storied legends, USC and Alabama, face off at AT&T Stadium in Arlington. Time: Saturday at 7 p.m. See website for ticket info. Don’t have a ticket and still want to join in on the fun? Here’s our list of sports bars and restaurants you could catch the game at with other fans. It’s that time of the year for fall ball, y’all! 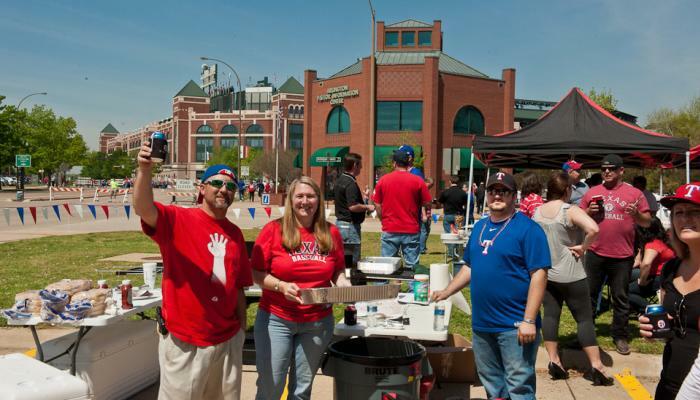 Head to the Arlington Entertainment district to root for the Texas Rangers when they take on the Houston Astros at Globe Life Park this weekend. Times: 7:05 p.m. on Friday, 3:05 p.m. on Saturday, and 2:05 p.m. on Sunday. Click here for ticket information and specials. Free music under the stars resumes this weekend with concerts by Grammy Award winners Brave Combo, plus there will also be shows by Delta Rae and Paul Thorn. Pack a picnic dinner complete with your favorite bottle of wine or brew, grab a chair, head to Downtown Arlington and have a blast. Times: Friday-Sunday at 8 p.m. Cost: Free (bring cash for the food vendors on site or BYOB). More. Conceived in 1999 as a celebratory exhibition of Lubbock art and music, this semi-regular show has gradually evolved into a wider presentation of prominent contemporary artists who live in or maintain strong ties to Texas. It’s called a “must-see” for anyone who has a passion for contemporary art. Dates and times: Friday and Saturday from 10 a.m. to 5 p.m. and Sundays from 1 pm. to 5 p.m. Cost: $8 (discounts for seniors and kids). More. Tickets to attend this special fundraising event include a catered dinner from Gino&apos;s East and three beer tokens to enjoy at Arlington’s newest craft beer destination, Legal Draft. After dinner, head over the Levitt Pavilion and enjoy listening to Delta Rae in reserved VIP seating. Sounds like one fine evening! Date and time: Saturday at 5:30 p.m. Cost: $75 per person or $125 per couple. Proceeds benefit the Levitt Pavilion. Space is limited. If fresh is your thing, head to the Viridian Farmers Market at Overlook Park next to the Viridian Lake Club, featuring fresh food products from local farmers, suppliers and craftsmen – plus live music and plenty of family fun. Date and time: Saturday from 8 a.m. to 1 p.m. Cost: Free. More. Enjoy bowling, laser tag, Putt-Putt, and arcade games at a big discount at one of Arlington’s most fun-filled family destinations. Dates, times and cost: Friday-Monday, discounted play is available 10 a.m. to 5 p.m. for $19.99 and from 5 p.m. to close for $24.99. More. Got friends, family, in-laws and outlaws camping out at your homestead this Labor Day weekend? Show ‘em what Arlington’s got with this list of cool things to do and see. Ten: Roller coasters, outdoor adventures, high-speed go-kart racing and soooo much more. Open for business this weekend: Six Flags Over Texas, Hurricane Harbor, the International Bowling Museum, River Legacy Parks, K-1 Speed, The Parks at Arlington, and the Arlington Highlands. So there’s just no excuse not to get off your sofa and have a little fun. Find out more.